Kids Math Teacher: Author Adventures! Being an author is a lot of work and it can be extremely rewarding! If you are following along my author story I am so grateful and I have updates! So, a few months ago kidsmenubooks.com (my book site) was revamped and now looks amazing (yay)! 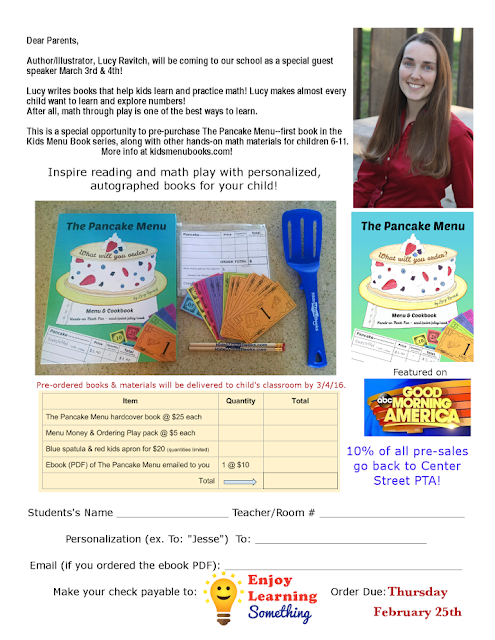 On the blog Math Coach's Corner Donna did a wonderful review of the book and I got a good amount of people that signed up to receive my monthly newsletter! I'm scheduled to go to Center Street Elementary (El Segundo, CA) in early March to do three assemblies for the 1st & 2nd grade, 3rd & 4th grade, and the 5th grade classes. I'll get to send my pre-order form home with them soon and I'm so excited to talk with them and encourage them to keep reading and playing with math! Then, a met a person from Mathnasium.com and we are planning to do a blog post for them and a giveaway at some point (the details haven't been finalized). There are even a few other items of book details going on... My search for a better ebook formatter for fixed format in ePUB and Mobi files. And then a rights manager. There are a lot of things that go into having a book... Things are moving along and I appreciate all the support and hope that this resource is loved by kids from all over!